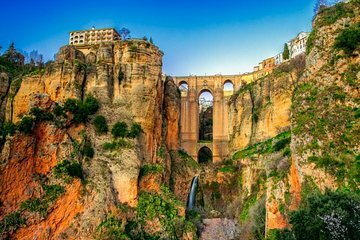 Ronda is famous for its dramatic setting, at the top of the El Tajo gorge, but there’s so much more to experience in the Andalucían town. This 2-hour walking tour offers a comprehensive introduction, including a spectacular view from the New Bridge, a visit to the house of Don Bosco, and a stroll through the atmospheric old medina. Itinerary subject to change due to special circumstances or by force of nature. In the event of such a change, you will be informed at the start of the tour.